Note: 72cc chamber heads have both vertical and diagonal exhaust bolt patterns. 76cc heads have vertical exhaust bolt pattern only. Direct bolt-on for 1961-76 Ford 390-427-428 V8. Complete heads include stainless steel 2.09'' intake and 1.66'' exhaust valves to clear the 4.050'' bores on a 390ci engines. These 428 Cobra Jet-sized valves promote excellent flow for streetable power. 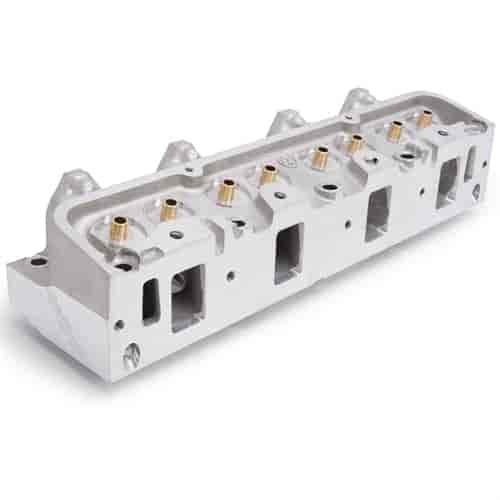 #350-60089 can be machined to accept 2.19'' intake and 1.73'' exhaust valves if desired. Rocker shaft mounting holes and exhaust bolt holes are heli-coiled for strength. Rocker shaft stud kit 350-6009 is highly recommended, it eliminates wearing of the threads and possibility of bottoming the rocker shaft bolts in the head. Use head bolt kit #350-8557. 390 GT exhaust will not fit. Does Edelbrock 60089 fit your vehicle?